In this day and age many should already be familiar with or have some knowledge on the appalling inhumanity that comes from the production of fur – stemming from the environment of such industries, the condition in which innocent lives live, to the actions and brutality that they endure and subjected to in order to fulfill the demands of this callous fashion and vanity trend. It is within these industries that hundreds of thousands, if not more, lives face fates worse than death everyday – branching from electrocution, being stomped on, having their fur ripped from their fragile bodies while still alive, and so many more horrific and barbaric experiences. Experiences that no life should have to suffer or undergo for any purpose. 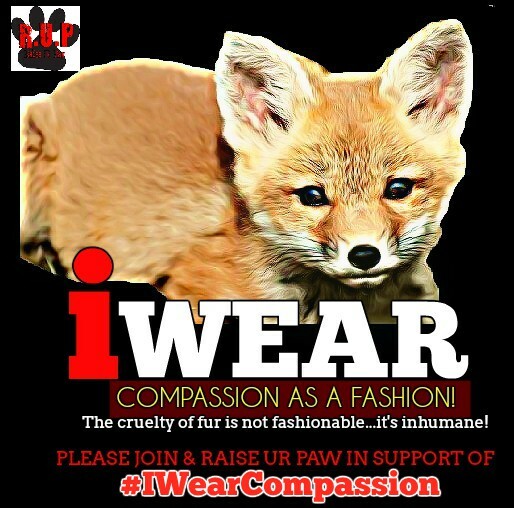 That is why we at RAISE UR PAW, a Canadian Not-For-Profit Incorporation, have created the “I WEAR COMPASSION AS A FASHION” campaign, which is focused and concentrates on not just to spread awareness about these horrendous and horrific fur industries, but to also merge voices worldwide in order to get these industrialized cruelty corporations prohibited and save the lives of the innocent. It is vital that the public is fully educated, and that the truth is acknowledged that these industries are not, nor will they ever be humane – and that we as humanity, will not allow such individuals and companies to pull the “wool” over our eyes by making claims that what they are doing is right, that the animals in which are enslaved within these fur-farms are living in appropriate condition & treated humanely... because the truth is what it is, no matter what kind of image they attempt to paint in order to popularize this profit-making cruelty. It is due to the publicizing and messaging that we as animal angels provide that extends the awareness of this reality – that the graphic images in which show this truth, are not meant or displayed in order for humanity to turn away, but to open humanity’s eyes and give knowledge to them of the issues, situations and extremities of suffering that these industries are bringing upon the lives of the innocent. Today and every day we need your support and be part of the movement to bring these corporations to an end, to save/protect the lives of the innocent, and assist the efforts to establish laws and enforcement that will end this inhumanity once and for all. Please take that little moment of your time to share this message and movement on networking sites, family & friends, every individual of the world. Take the pledge to “Wear Compassion As A Fashion!” – educate, encourage & empower. THE PURSUIT TO STOP THE INHUMANITY!